Summary: Inspired by true events, The Mule tells the story of a naive man who is detained by federal police with lethal narcotics hidden in his stomach. Alone and afraid, ‘the Mule’ makes a desperate choice; to defy his bodily functions and withhold the evidence… literally. By doing so he becomes a ‘human time bomb’; dragging cops, criminals and concerned family into his impossible escapade. Australia has always had a knack of making good retro drama films. Films like Two Hands, Dirty Deeds and even Animal Kingdom spring straight to mind. Throw in the fact that despite the amount of times he has been horribly mis-cast on the big screen Aussie audiences still seem to love Angus Sampson and you would think that The Mule is a sure fire winner for Screen Australia. But as every film journalist seems to like reminding people to film in Australia in its darkest days. 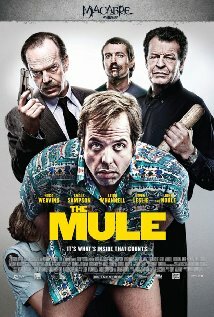 So dark at the moment that the people behind The Mule have decided to go about its release in a very unique way. Instead of The Mule being screened in cinemas right across the country it will only appear on a couple of screens before then becoming available to the mass community online. Of course all that aside you would still expect that The Mule be a decent film if the people are expected to watch it. And that’s where you might be in for a surprise. Flashback to 1983, a simpler time in Australia and the mighty Aussies were locked in a seven race fight with America to win the America’s Cup for the first time. At the same time a little Aussie battler named Ray Jenkins (played by Angus Sampson) was involved in a battle of his own. See normally Ray was a sensible man, he listened to his mother (Noni Hazelhurst), he played footy and he fixed televisions for a dodgy boss. But then during an end of season footy trip to Asia, which his Mum didn’t want him to go on in the first place, Ray listened to his Dad (Geoff Morrell) and his wannabee criminal mate, Gavin (Leigh Whannell), and decided to fill his stomach with condoms full of heroin. It should have been an easy crime but instead Ray messed up at Melbourne Airport and soon finds himself locked in a room with hardened Federal Agent Croft (Hugo Weaving) and the kinder Federal Agent Paris (Ewen Leslie) who decide they will hold onto Ray until he literally spills his guts. That’s when Ray decides that he can sit them out and hold out… or should that be on… until they can longer hold him. The Mule is actually a breath of fresh air in the Australian film industry because it gets so many things right. First of all as a first time director Tony Mahony (who shares the directional duties with Sampson) pretty much nails this film. He captures the period of 1983 well (despite the odd modern train appearing) and manages to mix the right amount of violence, comedy, drama and suspense together in a way that is not too dissimilar to an early Quentin Tarrantino. It’s rare that you watch a film where you find yourself barracking for a drug trafficker but just like the legendary Australian 2 yacht, here Ray is an Aussie battler taking it right up to the ‘big giants’ that want his scalp. Mahony is of course aided by a wonderfully written script by Sampson and Whannell. While the film doesn’t quite find itself in the realm of Two Hands it does mix its genres well and is enough to make its audience go through a whole range of emotions. There are moments when you are find yourself laughing out loud, gagging and almost vomiting at some of the things that Ray has to do with the condoms and at other times find the cinema to be in a state of suspense and it becomes unclear just how far Pat Shepherd (John Noble) and is henchmen are willing to go to silence Ray and his family. And as if the script hasn’t already delivered enough to like by then it then has a huge twist that most audience members certainly won’t see coming. The cream on the cake in this film is the casting. The normally strong Noni Hazlehurst and Geoff Morrell once again deliver gold but it is the two leading men here who lead this ship to the winning post. It’s not too cruel to say that Sampson has been badly miscast a number of times over his career, none more obvious than in Incidious, but here Sampson delivers everything you would want to see a comedic leading man deliver. The fact that he also does well during the dramatic scenes shows that perhaps we have all misjudged Sampson over the years and he just need the right role to show us all what he is really capable of. Then opposite Sampson of course is Hugo Weaving who goes into complete bad guy mode playing ruthless, sexist, 1980s Federal Agent Croft to a tee. Croft allows Weaving to deliver some well timed punches to the stomach, sarcastic wit and beautifully delivered snarls alarmingly well and you hope the fact that this is one of Weaving’s best roles might mean that a few more people want to hunt down a copy of The Mule and give it a watch. The Mule could well be Australia’s sleeper hit film of the year. It seems to take the qualities that most Australians like to see in their cinema and place it all together – the crime grit of a movie like Animal Kingdom mixed with that quirky Australian humor that saw Red Dog become such a big hit and just a hint of the battler story that made The Castle a must see. While the electronic release may frighten off some people The Mule is one Aussie film that is a must see this year. Other Subculture Entertainment The Mule reviews: For our full The Mule review please check The Good The Bad The Ugly Film Show Ep #105 . You can also read Dave’s The Mule review on The Book The Film The T-Shirt.